As always, things afoot. Just time for the highlights, today. I’ve put an item up on my shop– it’s a pair of my space shoes. They’re made to-order, so if you’re thinking about a pair, keep that in mind. I’d even be willing to *think* about having them not be two different colors, but… I dunno. Seems weird. Holler at me if you want a pair. The second round of my analog zine is coming along. They take a really, really long time for me to do- and that’s ok. It’s the process, for me, that makes them interesting. I’m also getting a lot better at layout and planning as a result of these, so it’ll be interesting to see what sort of impact that has on my other work. 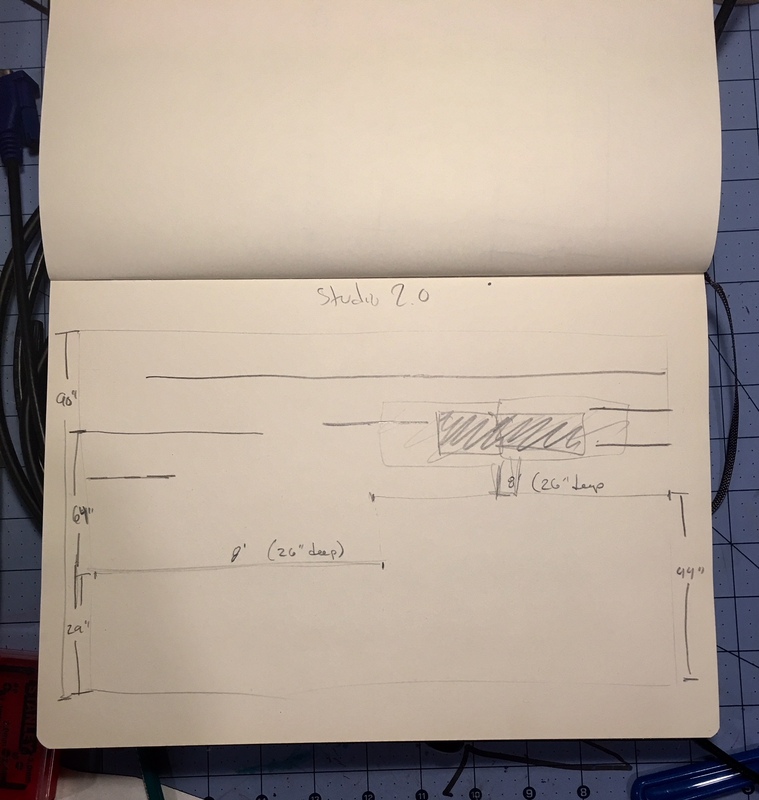 Studio Desk v0.3 is coming along- I’m starting to settle somewhat on the layout and proportions, and now some of the details (wire and power management, port accessibility, finishes, etc) are coming into better focus. This is less an update on status (my standard SitRep posts), and more some smaller look at how I manage some my projects. Just a small look, mind you. 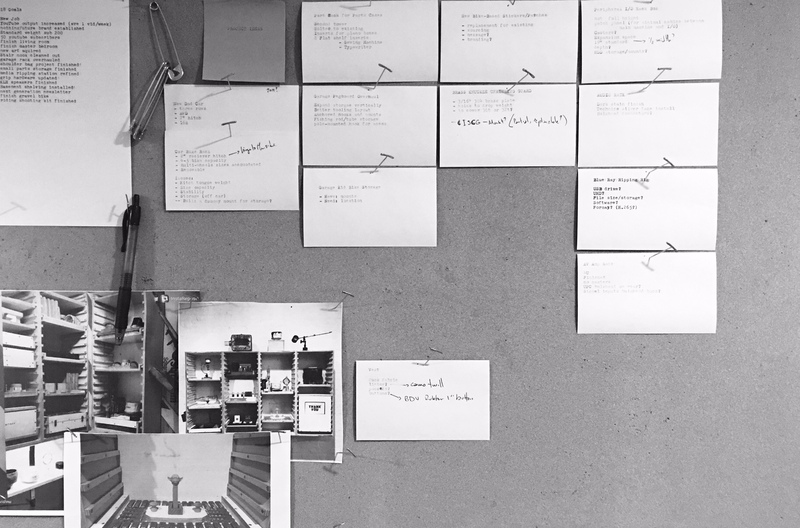 This is a (partial) look at my project board- anything that I’m even thinking of making. It gets added to an index card, and pinned up. I (usually) organize them by category (bike, house, clothing, etc), but I shuffle them pretty often to see if anything lines up or can be batch processed. From here, these cards get filed as “finished” when the project is completed or “abandon” when I decide it’s not something I want to pursue. Every once in a while, on the rare occasion I’m feeling dry creatively, I sometimes paw through the “abandoned” cards for inspiration- I almost never re-up a project as-is. For projects involving building, I usually spend some time sketching before I begin work. I have a couple of notebooks, depending on the scale I need, but this example is from my largest. It’s done in pencil, and it’s deliberately loose right now. I had the idea to overhaul my studio into a more functional space- that means more desk space and more storage, all while looking a bit less hodge-podge than things currently do. I’ll be installing a massive (16′ long!) work-wall, with (double) vertical desks build in- plus more shelving storage, cable management, and lighting. It’s about as big a project like this as I’ve taken on, and I know (based on finishing requirements) that I won’t be doing much until I can work in the garage again- the stain and polyurethane don’t like below freezing temps. But: I’m spending between now and then sketching and sketching and thinking to get the plans as solidified as I can, so when the temps finally break, I’ll be able to get right to work. So, for now, the sketches live here, and I’ll be revising and adding detail as I go. It’s the thinking that’s important, as it’ll make the construction go far more quickly, be less expensive, and better fit my ultimate needs. 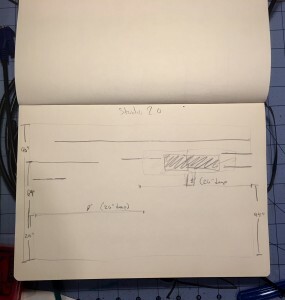 So: between the board (to see the full range of the projects that are active) and the notebooks (for project details, sketches, equipment buy lists, etc), I find I manage to keep a reasonably good eye on what project is on which burner. For stuff I’ve never done before (like this studio 2.0 project), there’s a much-needed hibernation phase. 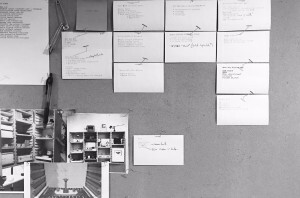 I need the time to think through iterations on projects so I don’t have to build as many physical iterations. For some stuff (like my long suffering shoulder bag project, currently on prototype #5), that build/test/build is a normal part of the process- but when I can (and especially for larger stuff like this), I need to minimize the number of physical revisions.